While you may not be aware, when it comes to your gadgets, with more use comes more germs and bacteria–not to mention a build up of makeup and oils. It’s this buildup on our iPhones, iPads, Tablets and smartphones that can lead to the spreading of germs leading to the flu and those sneak attack breakouts on your face. 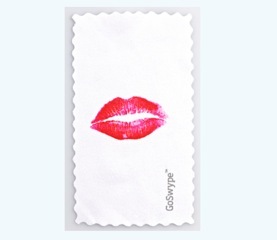 Enter the solution: I’d like to introduce you to GoSwype microfiber cleaning cloths. GoSwype cloths are reusable wipes made specifically for your touchscreen devices and for removing the nastiness they help to eliminate. Cleaning your phone should be just as much a beauty routine as washing your face! Finally a simple solution that keeps your device clean, your skin clear and yourself germ free.